[Steven’s] at it again with another cool science experiment that isn’t too difficult to do. This time he’s made himself a Nitinol wire inchworm, which actually moves across the table when you apply a switching electrical current to it! Nitinol is a shape memory alloy which has a cool property that causes it to retain (and return to) a preset shape when heat (or electricity!) is applied. It’s actually quite simple — he’s wrapped the Nitinol wire tightly around a nail, and then heated it to set it to a coiled shape. Now the Nitinol spring can be stretched out flat, but as soon as it is heated, it will attempt to return to its coiled state! Using some balsa wood and a few other odds and ends he’s taken advantage of this memory effect to make an electric inchworm — check it out after the break! [Alica] and [Jerika] are seniors in the Digital Culture program at Arizona State University and for their capstone, the wanted to take something that is traditionally male dominated and make it more female friendly. They chose e-textiles, which are most commonly extremely avant garde and nearly unapproachable with a lot of LEDs and zany mechanisms. Their initial designs reflected this, with multiple LED strips and huge shoulder pads. Then they discovered Flexinol shape memory actuator wire, and found this could be a much ‘softer’ integration of technology with haute couture. [Jerika] and [Alica] chose to create an electronic flower, able to bloom with the help of a shape memory alloy. When a current is applied to the Flexinol wire, it contracts. Sewing these wires into laser cut fabric petals, the girls created a fabric flower that booms with the help of an LiliPad Arduino. While they weren’t able to complete their dress due to electronic weirdness and burning out the wire too soon, they did succeed in creating a flower pin that demonstrated the intended effect. What if you could make paper react on physical input. Maybe you want it to shy away and close up if someone reaches for it too fast, or maybe you want some realistic paper flowers? Moving on to that great first step is Animated Paper, which is simply nitinol memory wire bonded to paper via our favorite tool, duct tape. Memory wire is first bent to its desired shape, and in order for it to hold that shape it needs to be heated to about 540 degrees Celsius, which is a easy task for a propane torch. Once it has its memory shape the wire can be bent into any shape desired, and when heated to about 70 degrees Celsius will return to its original set shape. 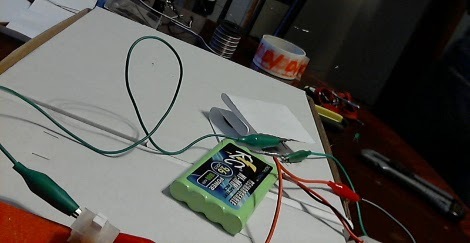 Taped down to a sheet of paper and letting some current from a battery run though it the wire quickly warms up and animates the paper, which could be exactly what one needs in a more artsy robot or electronic display. Join us after the break for a short video.